The Isuzu Huntsman is tailored to cater for the huntsman’s every need; a pickup truly fit for purpose. For a higher calibre Pickup, the Huntsman accessory pack is specifically designed for the professional, dedicated huntsman and countryman. 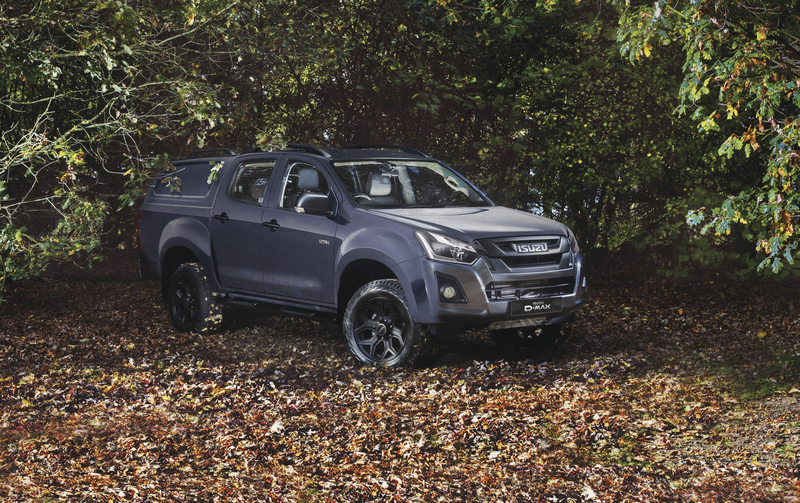 This accessory pack is a supplementary pack available for the Isuzu D-Max Utah Double Cab in either manual or automatic transmissions and it features an Aeroklas commercial canopy with black roof rails & vent, premium protective mat set, black side bars + steps, high-mounted tow bar which allows for excellent ground clearance, with 13 PIN electrics, aluminium under guards & rear diff protector. Also included in the pack is a lockable out of sight aluminium drawer system as well as ample bed space for dog boxes or equipment, 18” black alloy wheels with Pirelli all terrain tyres, tailgate ProLift, under rail bed liner, multifunction colour touchscreen + satnav, de-chromed door handles perfect not to dazzle or shine, mirrors & front grille. Optional extras include Single dog box, Double dog box, and black leather interior. *3.5 tonne towing capacity applies to all 4×4 models. 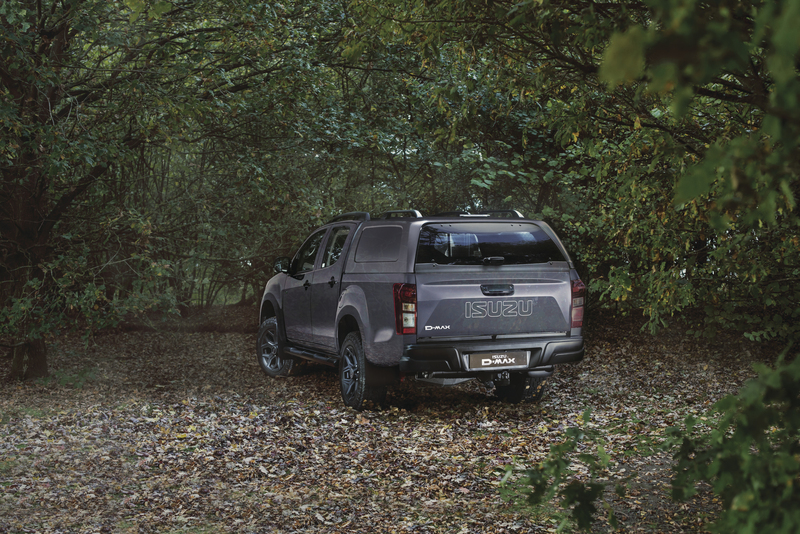 **125,000 mile/5-year (whichever comes first) warranty applies to the Isuzu D-Max range. The Huntsman Accessory Pack comes with a 3 year/60,000-mile warranty. The Huntsman accessory pack is available in discrete, Obsidian Grey or Cosmic Black, and comes fitted with 18” black alloy wheels. The new engine meets stringent Euro 6 emissions standards without the need for AdBlue. It has class-leading fuel economy of 40.4mpg combined. To enhance ride comfort and handling, the optional Huntsman Plus Pack features the Pedders Suspension Kit. 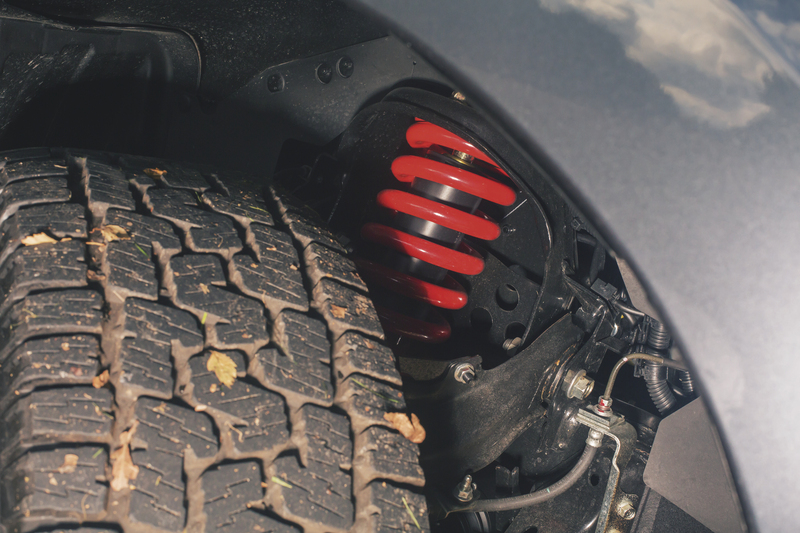 Designed for increased suspension travel whilst improving vehicle stability. 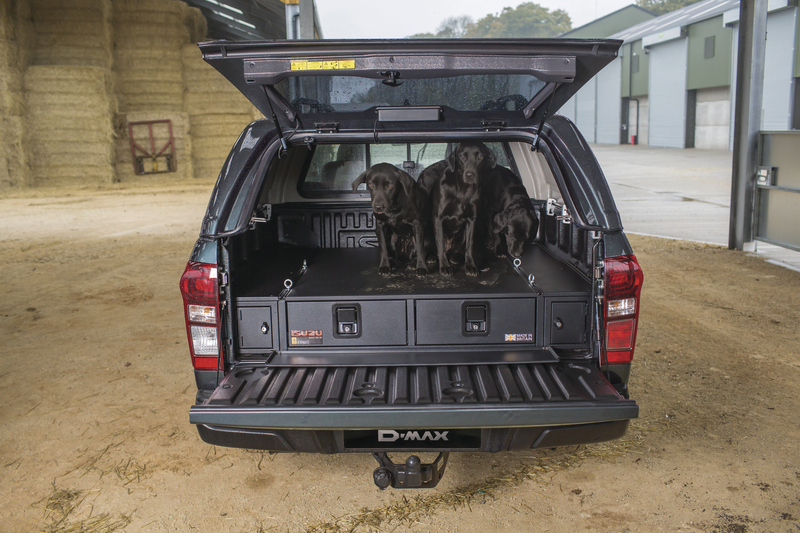 The great addition to this pack is the lockable, out of sight aluminium drawer system and the ample bed space which is perfect for dog boxes or equipment.